Chad Collins nearly made history Friday, but his 11-under par 60 was enough for a four-shot lead at the halfway stage of the PGA Tour's Barbasol Championship. 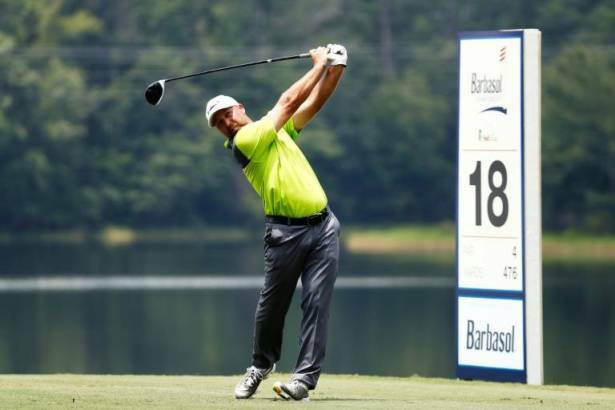 The 38-year-old American came within a whisker of an a rare 59, just missing a hole-in-one on the par-three 17th at the Robert Trent Jones Trail Grand National course in Auburn, Alabama. His tee shot bounced twice on the green then rolled straight at the hole before catching the right edge and skipping over. He ended up parring the par-three hole. "Hit a good shot, but I hit it a little heavy," Collins said. "I didn't think it was going to get back there and it must have had a lot of overspin. "I wasn't sure how close it came to going in, but had to come pretty close." Indeed it did. He was trying to become just the ninth player in USPGA Tour history to shoot 59 but settled for 60 to tie the tournament course record. "I gave it a run. I'm not too disappointed at all by 60, so I'll take it," Collins said. His 11 birdies allowed him to finish at 15-under 127 for a four-shot lead over fellow Americans Grayson Murray and Cameron Tringale. Murray fired a seven-under 64 while Tringale shot a five-under 66 to finish at 11-under 131. Canadian David Hearn (65) and Brian Gay (63) were tied for fourth at 10-under 132, five shots adrift of Collins. Many of the golfers had to finish their first round Friday morning after a storm Thursday halted play for two hours and then darkness fell. The second round was a bright spot in an otherwise disappointing season for Collins so far. He sits 170th in the FedEx Cup standings and this marked just the fifth time he has made the cut in 2017. Collins had several chances to get to the magic 59 as he made six straight birdies on the back nine starting on the 11th hole. On No. 15 his approach shot landed just two feet from the hole for an easy birdie. Then at 18, his 70 foot putt over a slight ridge, snaked left then just to the right, leaving him five feet past for par. "I just got myself out of position off the tee, which you can't do," Collins said. "Probably one of the easiest hole locations on the green, so it was kind of unfortunate to not hit the fairway and I probably would have had a better look at birdie there." Jim Furyk, who is tied for 42nd, holds the Tour record with a 58 that he shot at the 2016 Travelers Championship. Adam Hadwin and Justin Thomas both shot 59s earlier this year. New Zealand's Steve Alker and American Tag Ridings both shot 67 and are part of a group of four at nine-under. The hot muggy Alabama conditions had players and their caddies feeling the heat Friday. Shawn Stefani finished his second round without his caddie Chris Callas, who had to leave the course on the back nine to receive medical treatment. "By the time I got to the third tee I started to break out in cold sweat," said Callas, who has been caddying for six years. "The paramedics told me it was good I came in when I did because I wasn't in good shape." Stefani was tied for 10th after shooting a 65 while using a PGA Tour worker, who had never caddied before, as a late round replacement. The tournament, played opposite the British Open at Royal Birkdale, features a field largely drawn from outside the top 125 on the US PGA season points list looking to rise and qualify for the season-ending playoffs.